Hydrangeas are versatile and easy to grow. They are not at all particular about where they’re planted. All they need is well-drained soil, some water and a little bit of shade during hot summer days. Find out even more about hydrangea care in our Complete Hydrangea Guide! Oakleaf varieties are the easiest type of hydrangeas for beginners to grow. Why are oakleaf hydrangeas so easy? They aren’t picky! Oakleaf hydrangeas can tolerate colder weather, handle more sun, withstand drought, are more disease/pest resistant and grow in sandy soil better than other hydrangeas. The catch? All oakleaf hydrangea varieties are white. Here are the best hydrangeas for beginners to grow. Alice Hydrangea – Big, strong and beautiful! Alice was dubbed the most robust and trouble-free hydrangea by the University of Georgia. Be warned, Alice is a big gal and can grow to be 15’ tall with a 15’ spread. 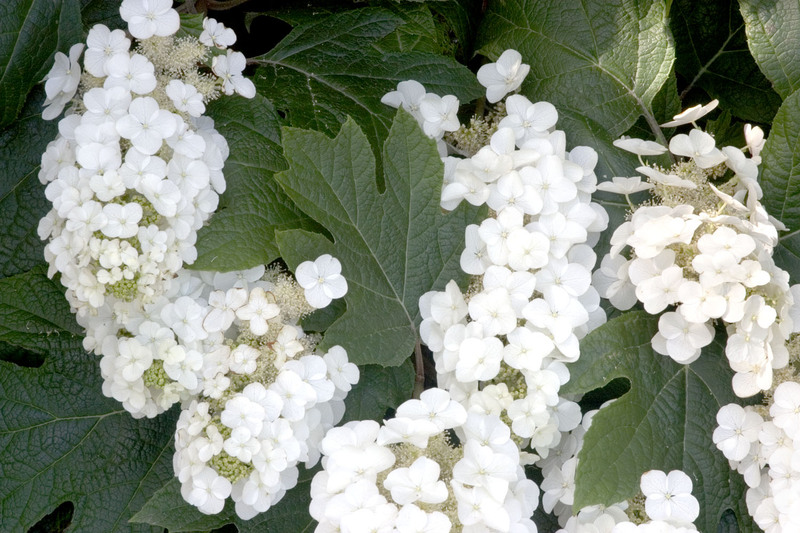 Snowflake Hydrangea – Enjoy the beauty of snowflakes in the middle of summer. Snowflake hydrangeas have the longest bloom time of any oakleaf hydrangea. Plus, its double blossoms make it really stand out! It’s easy to see why this is one of the most popular hydrangeas. Ruby Slippers Hydrangea – Tiny but mighty! Growing no taller than 4’, this compact hydrangea explodes with 9” flower blooms. And those blooms can last up to two months. If you think you don’t have room for a hydrangea, think again. Ruby Slippers will fit in even the smallest garden! Once established, fertilize your oakleaf hydrangea with Espoma’s Plant-tone every spring. Learn about hydrangeas that bloom all summer. Find out even more about hydrangea care in our Ultimate Hydrangea Guide!